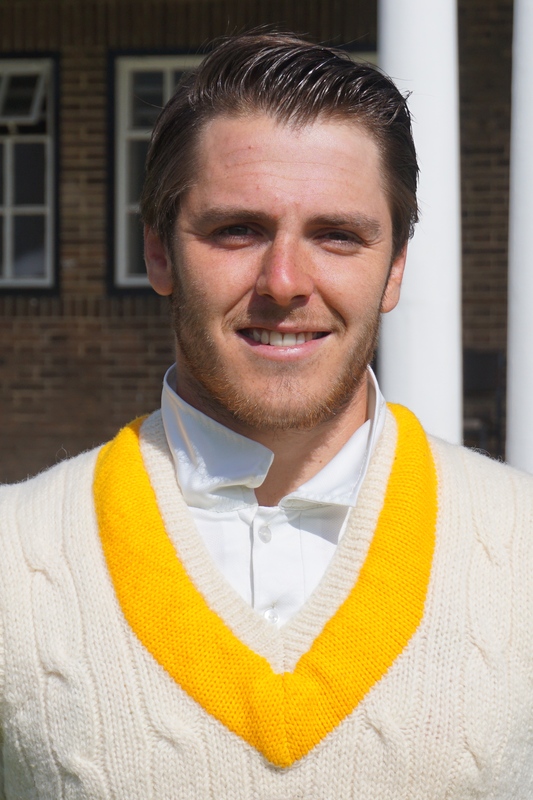 The Yellows made it 2 out of 2 in the MCCU 2-day competition when they completed an Oxbridge double by defeating Cambridge on the first innings at a bitterly cold Weetwood. After being put in the home side batted consistently throughout their innings with a number of steady partnerships. Steve Bullen & Billy Root put on 125 for the 2nd wicket – a record for the team against Cambridge – before Root was caught at backward square for 65 with the total on 166. Bullen was the next to go for another fine half-century; hitting a full toss to midwicket when on 99. Painful but expert jug-avoidance once again following his 97 against Lancashire. Remarkably in a total of 401 for 9 declared, these two were the only ones to score over 50 – Weston falling one short, with Davis (40) & Rouse (36) also making good contributions and everyone else chipping in. It must be some time – if ever – that the boys have made totals of 400+ in two consecutive innings. Cambridge had 13 overs to face before close of play, during which the Yellows managed to grab two wickets – Alex Lilley removing Barna-Laue’s off stump with an absolute pearler and Doug Pratt inducing and edge from Wright, the Light Blues closing on 34 for 2. Harry Ellison must hate Weetwood. In 2013 he was dismissed 3 times in 6 deliveries (one a no ball) & in the BUCS game on Monday faced only 3 balls before falling for another duck. This time though he buried the ghosts by scoring an accomplished 82 before Liam Watkinson’s golden off-spin arm managed to bowl him. The only other resistance came from Ruari Crichard who 69* batting at No.9 and sharing in an 8th wicket stand with Ellison of 79 as Chris Scott’s boys were all out for 209 in 68.1 overs to give the Yellows a win on the first innings. Bowling honours were shared around with the seamers all putting in a great workload in cold and windy conditions – Lilley (3-47), Watkinson (2-18), Rouse (2-26), Pratt (2-55) & Myers (1-6) sharing the wickets. With 49 overs left in the day an outright win was a possibility if early wickets fell. Cambridge saw thongs through to the close though losing only 3 wickets for 128 runs, securing 2 further batting points to our extra 1. Total Points: Leeds Bradford 19, Cambridge 8. This puts us at the top of the 2-day table after the first couple of rounds of fixtures, 10 points clear of Loughborough & 13 ahead of Cambridge. Next up – a road trip to Solent for our BUCS game on Monday 4th followed by a BUCS encounter and 2-day game against Cardiff on the Tues, Weds, Thurs. Following last weeks loss in the BUCS competition to Oxford, Andrew Lawson’s side were keen not to make it at Oxbridge double defeat when Cambridge were the latest visitors to Weetwood – and an all-round clinical performance ensured that wasn’t the case. The Light Blues won the coin flip and decided to bat on a sunny but chilly day. Wright & Barna-Laue began steadily but with the score on 24, Alex Lilley struck twice in the 7th over – first trapping Barna-Laue leg before and then getting rid of Ellison in the same way 3 balls later. The only real resistance of the innings came from Joe Tetley, (obviously a Yorkshireman with a name like that) who had made 62 from 64 balls before driving Joe Ellis-Grewal to long off where Ryan McKendry took an excellent catch low down after sprinting in. Archie Ogden was the pick of the bowlers, taking 3 for 26 in 8.3 overs, including 2 in 2 balls when Tice was leg before and then Crichard lost his off stump. Rouse, Ellis-Grewal & Lilley all picked up 2 scalps apiece but it was the Rotherham left-armer who caused the most problems as he wrapped up the innings with another successful LBW shout in the 42nd over with the total on 146. Chris Wakefield was caught out for 11 in the 4th over but Steve Bullen played in customary aggressive style before skying Arif to mid off after scoring 43 from 51 balls (6x4s). Billy Root carried on batting the way he has for the last week or so, hitting some beautiful looking drives and once again sharing a significant partnership with Christian Davis. Root hit the winning runs with a maximum over long on to finish on 59* (58 balls, 9×4, 1×6), his skipper closing on 29* (28 balls, 4x4s), with 25.4 overs to spare. In the Yellows’ last 3 innings Root & Davis have shared partnerships of 175, 134 and 89* – an average of 184. A couple of old boys – and one old opponent – are at Weetwood today as Leeds Bradford play hosts to a MCC XI in a 50 over game. Andrew Rennison (2006/7) and former captain Will Vanderspar (2012-2014) are pictured below in younger, more carefree pre-graduate days!! 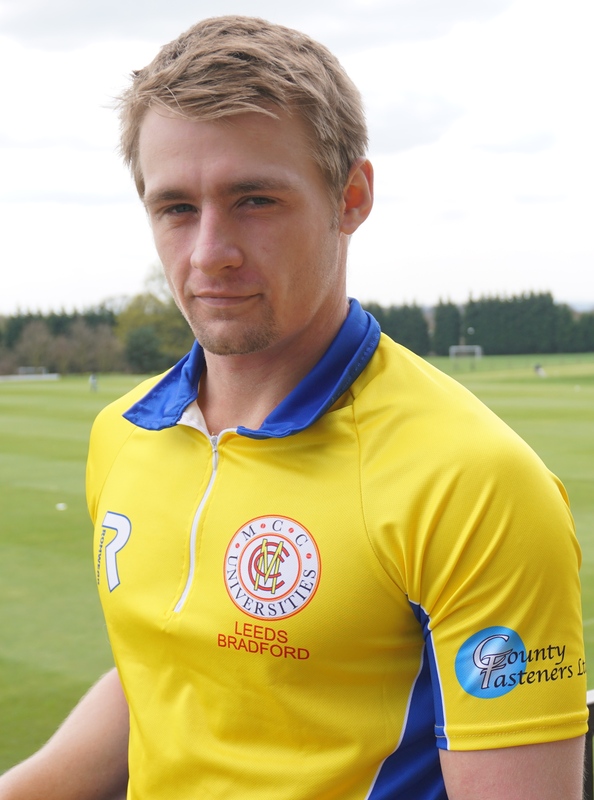 Ex Loughborough players Adam Soilleux is also representing the visitors. Good to see them all back on another cracking day of sunshine!! A good measure of the strength and spirit of a team is how they can bounce back from adversity. 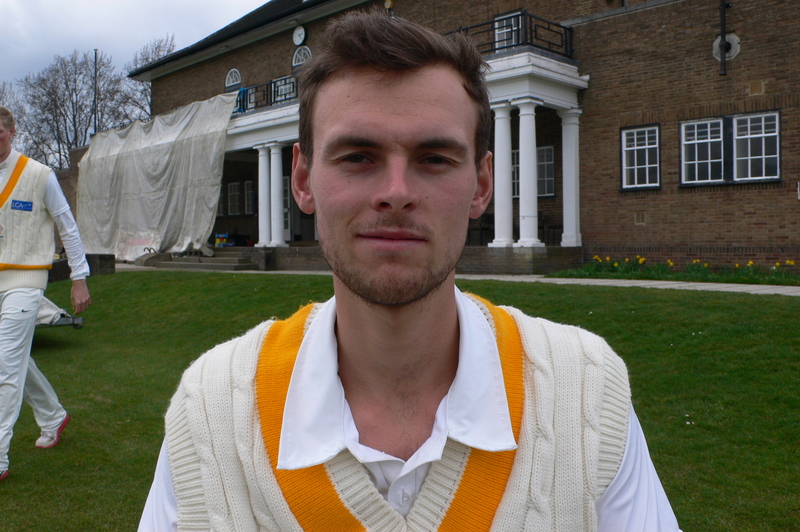 Leeds Bradford’s ruthless demolition of Oxford in their 2-day MCCU Challenge fixture following defeat against the same team in the BUCS competition showed they have these assets in abundance, whilst gaining a win on the first innings by a massive 274 runs. After closing Day 1 on 486 for 7, Christian Davis decided to bat on for a few overs to get over the 500 mark. George Scott was caught at long on for 58 (55 balls, 5×4, 1×6) and when Davis declared with the total on a record-breaking 506 for 8 Alex Lilley was undefeated on 65 (50 balls, 8×4, 1×6). In glorious sunshine for a 3rd successive day and on a wicket still showing little assistance to the bowlers, getting 10 wickets in 100 overs was going to be a tough job. Knowing that reaching there target was pretty much out of the equation for the Oxford boys, Steve Leach & Henry Hughes began cautiously yet solidly against Lilley & Doug Pratt. Davis rotated his bowlers, knowing each would have a heavy workload through the day, and it was Liam Watkinson who struck first in the 15th over when Leach drove loosely and edged to the safe hands of Logan Weston at second slip with the total on 36. Harry Rouse came into the attack, bowling with good pace and decided to test the batsmen with a few bouncers. With two men out Hughes fell into the trap, pulling a short one to Joe Ellis-Grewal at deep backward square to reduce the visitors to 46 for 2. The blonde all-rounder struck again 4 overs later when a brilliant yorker was too good for Lloyd Paternott. It was a delivery – and a celebration – that Yorkshire’s Jack Brooks would have been proud of! Lloyd Sabin and Luke Webb began to rebuild to ensure no further wickets were lost before lunch and had extended their partnership to 52 when Pratt found Sabin’s edge, Bullen doing the rest. This was the first of 4 wickets for 15 runs, Pratt striking again 10 balls later when a leading edge from Webb was taken by Scott at 4th slip, the seamer at this point having taken 2 for 10 from 10 overs. Pratt the claimed his 3rd scalp when Ellis edged to Lilley at 3rd slip before Jack Myers took his first wicket for the Yellows when Jack McIver offered no shot & was given out leg before. Why, why, why . . . McIver; Bye, bye, bye . . . McIver. At 122/7 Davis’s biggest problem was deciding whether they should bat again or have another bowl in a bid to gain extra bonus points. However, Sam Weller, the Oxford skipper and Bruno Broughton combined to frustrate the tiring attack and at tea the Dark Blues were 171 for 7. They extended their partnership after the break to 80 in just under 30 overs before Watkinson made the crucial breakthrough. Turning to off spin as opposed to his usual medium pace, the Lancastrian lured Broughton to edge to a jubilant Davis. Weller was still digging in, in a valiant bid to secure a draw for his team but his vigil came to an end after 131 minutes and 145 balls when he tried to turn Pratt to the leg side, only for a leading edge to spoon the ball up to Davis at cover. The last-wicket pair of Sakande & Grundy would have to bat for another 12 overs in order for the points to be shared but with Pratt eagerly searching for his 5th wicket and still bowling at a fair lick, Sakande edged him to third slip where a helmeted Billy Root took a sharp catch at head height to dismiss the visitors for 232. With 8 overs still left in the day the Yellows went in to bat again, searching for the further 75 runs required for an additional batting point. Surely 125 for two batting points would be unrealistic? Bullen & Thompson tucked into Sakande & McIver with relish, Thompson even dispatching the first ball of his innings for 6!! Bullen was run out in the frantic search for quick runs but then a spectacular cameo from Root (40 from 12 balls, 2×4 & 5×6) including 23 off one over from Sakande and Thommo’s equally dashing 34 from 19 balls (3×4, 2×6) made the 125 look like a possibility!! After they both fell in quick succession Weston & Scott took up the challenge but task proved just too much, the overs running out with the score on 108 for 3. All in all a fantastic couple of days work from the boys – good, consistent batting throughout the order plus patient, disciplined bowling – and only a couple of errors in the field that spring to mind. 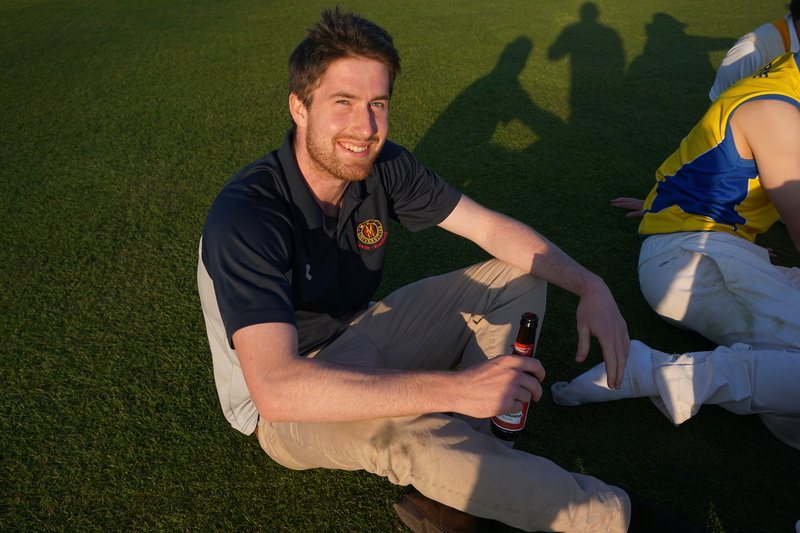 Captain Davis hailed Pratt as Man of the Match for his 5 for 33 from 20.1 overs – a monumental effort on such a track and in amazing weather for April at Weetwood. Few would argue despite many other solid performances. It was good to see a decent crowd watching the last 3 days cricket and England Rugby Head Coach, Stuart Lancaster, was particularly welcome – as well as being extremely impressed with the standard of cricket on show! 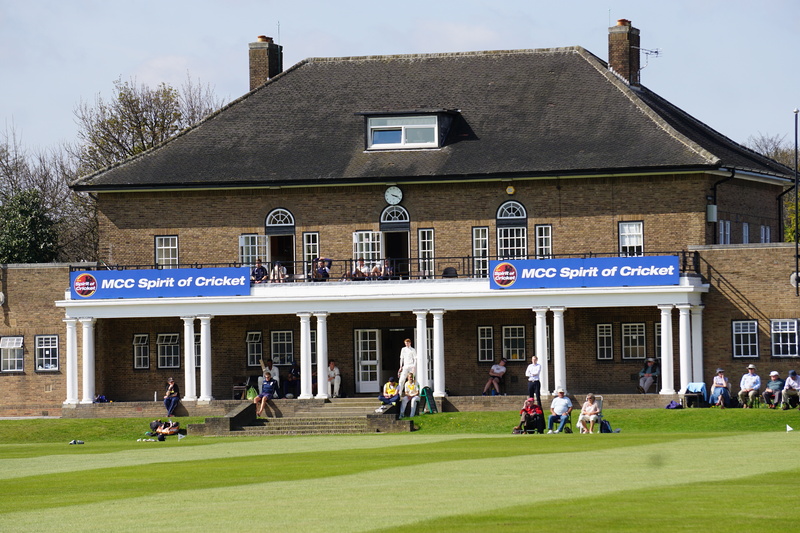 Following their poor performance in defeat yesterday, the Leeds Bradford boys certainly made hay in the sun at Weetwood on Day 1 of their 2-Day MCCU Challenge match against Oxford MCCU, on a day when records tumbled. Christian Davis won the toss and chose to bat on the same track that had been used the previous day. To make this decision pay it was clear the Yellows would have to bat long into the day and show more urgency and application than in the BUCS game. And boy, did they!! Despite losing both openers within the first dozen overs with only 55 on the board – Henry Thompson pushing a return catch back to Sakande and Steve Bullen becoming the first of 4 leg before victims in the day – the 3rd wicket pair of Billy Root & Davis tucked into the Oxford attack with increasing authority as the morning session went on. The Dark Blues were hampered when their skipper & opening bowler, Sam Weller, had to leave the field for treatment to a leg injury but by lunchtime the pair had taken the score to 160 in 34 overs, with Root on 64 & Davis 67. As the temperature increased in the afternoon the batsmen kept the heat on the Oxford bowlers by playing shots all around the park. Root was the first of the pair to reach his century but fell shortly after reaching the landmark when McIver rapped his pads and he was adjudged leg before. The left-hander had scored 103 from 145 balls, with 17 x 4s & the 3rd wicket partnership had realised 175 runs – a record for the Yellows in the 2-Day competition. Davis the notched his first ever ton for the team but when on 107 he hit McIver straight to Steve Leach at midwicket, his runs having come from 125 deliveries with 14 x 4s and 2 x 6s. At 245 for 4 plenty of work still had to be done to make the decision to bat prove to be a shrewd one. 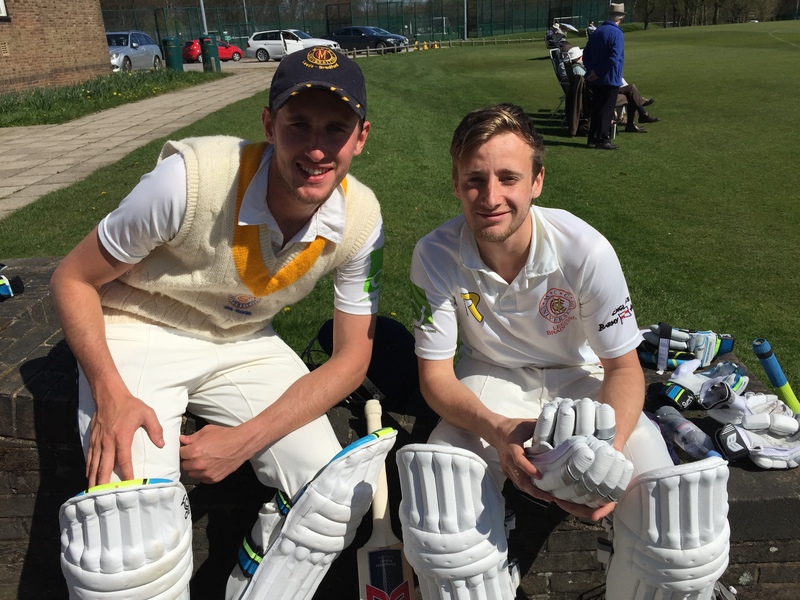 Yesterday’s batting star, Logan Weston, joined forces with Harry Rouse and together they shared the second hundred partnership of the innings, adding 102 in 30 overs before Rouse nicked Sabin behind four short of a deserved half-century. It was the all-rounders most assured knock for some time and at 347-5 the platform was well and truly set for a formidable total. Weston became another leg before victim, umpire Prince deciding the ball would have hit the stumps despite the large stride down the track, but the Leeds Beckett student’s 71 (109 balls, 9x4s, 1×6) brought his total runs over the last couple of days to 160. 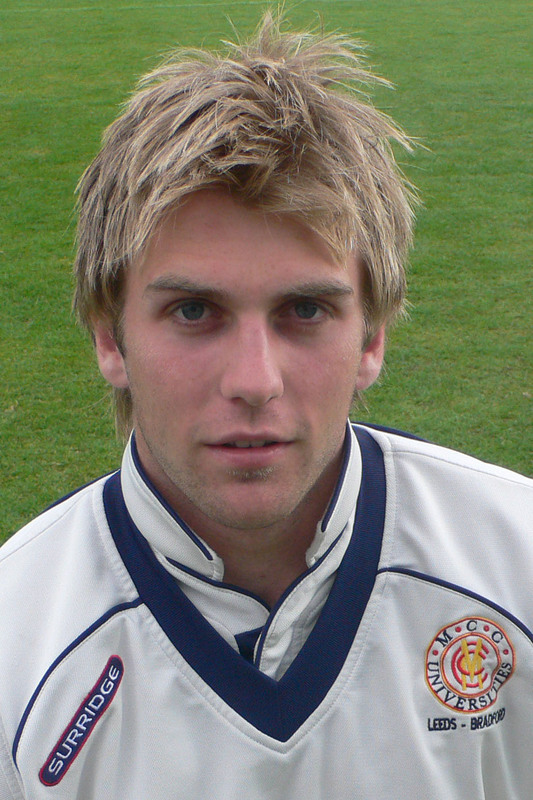 Liam Watkinson quickly became yet another LBW victim but his wicket was to give Oxford their last cheer of the day as George Scott and Alex Lilley compiled the 3rd century stand of the day by plundering a tiring attack for a further 108 runs in only 12.4 overs – a new Leeds Bradford record for the 8th wicket in all formats of the game. When Davis had elected to bat at 10.30 am he said that his batsmen would have to ensure they were still at the crease in the final session in order to capitalise on the weary bowlers, and his plan worked out precisely! When Scott (51*) & Lilley (59*) strode off at the close of play the total stood at 486 for 7 – a record total for the Yellows in any form of cricket. On what is still a fine batting track the bowlers will all have their work cut out tomorrow, but the batting effort was monumental and an infinite improvement on the previous days’ performance. Play resumes tomorrow at 11.00 am. 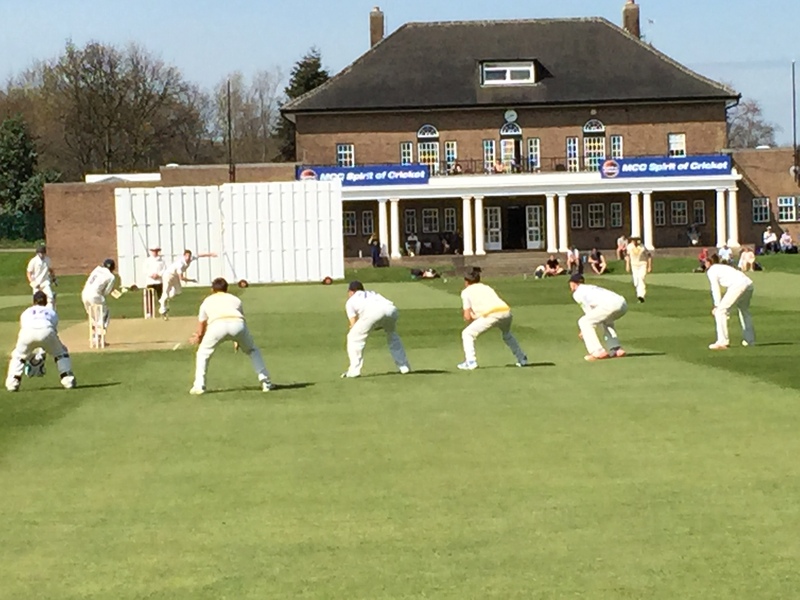 The Yellows put in one of their worst performances in the last couple of years in going down by 4 runs to a much-improved Oxford MCCU team in the BUCS tie at Weetwood. The Dark Blues won the toss and elected to bat on a bright & sunny afternoon, making a superb start with stands of 76 & 75 for the 1st (Paternoot & Sabin) & 2nd wickets (Paternott & Hughes) respectively, all three batsmen running well between the wickets and capitalising on some short bowling. Steve Leach (36) also batted well and a great cameo at the end of the innings by Oxford ‘keeper Ellis (24 from 12) took them to a total of 268 for 8. Liam Watkinson (3-38), Alex Lilley (2-40), Joe Ellis-Grewal (1-38) and Archie Ogden(1-68) were the wicket takers, but overall the bowling and fielding wasn’t up to usual standards. Chris Wakefield fell early on but Steve Bullen & Billy Root shared a partnership of 72 from 9 overs before Root holed out to Leach at deep extra cover for 38 (23 balls). Christian Davis was then run out for 15 after a mix-up with Bullen, then the opener himself was out to the third ball after drinks when he pulled McIver straight to midwicket. At 127-4 the Yellows were up against it and the innings really stalled between the 21st & 30th overs with only 18 runs being added for the loss of 2 wickets. Logan Weston then batted superbly though, finding the gaps, working the ball, running well and capitalising on anything loose. He’d scored 89 at just over a run a ball before he became the 7th wicket to fall, being bowled by a good yorker from Sakande with the total on 254. That left the Yellows needing 14 to win from 11 deliveries. Lilley went for 2, Ogden & Rouse being unable to manage the 9 required from the last 5 balls as Oxford clung on to win by 4 runs. Hopefully lessons learned all round and the boys will be determined to come back stronger in the 2-day game against the same opposition on Tues & Weds.